"When you're sick, nobody calls you. But when you die, everybody comes to the funeral." More than any other city in America, Los Angeles is a place of constant reinvention, a town where a film like Home Alone passes as an old classic. It's a city built in large measure on an industry of dreams—but even our biggest dreamers have got to eat, and the storied restaurants of Southern California, by virtue of the star wattage of their clientele, have reputations far beyond the boundaries of L.A. County. Some of them, like Musso and Frank's and the Formosa Café, remain largely as they were, now self-conscious tributes to the ways of Old Hollywood; others, like the Brown Derby, exist only in our collective memories. And so when word came down, in early 1995, that Chasen's, one of the most storied of L.A. eateries, was to be vacated to make way for a strip mall, Shari Springer Berman and Robert Pulcini wisely decided to make a film about it, lest this be just one more instance of self-induced Angeleno amnesia. What they've produced here is a loving portrait of an institution, with as much reverence for the old line celebs as affection for the dedicated restaurateurs who made serving hobo steaks to the rich and famous their lives' work. Things after vaudeville didn't quite break the way Dave Chasen had hoped, so he took his winning personality and famous chili recipe and opened a restaurant on Beverly Boulevard. The filmmakers tour us through the history of the restaurant and the Chasen family; Dave has since passed, his wife was edging toward 90 at the time, but their grandson, Scott McKay, was still a part of the family business. 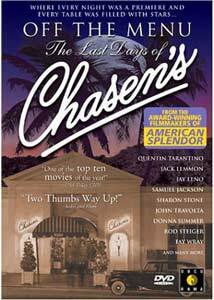 And from the very beginning, Chasen's attracted clientele that would attract the paparazzi—the walls of the place were festooned with things like a thank-you note from Richard Nixon for a chili delivery, and Elizabeth Taylor was notorious for having the stuff imported to the shoot of Cleopatra. It's real old time Hollywood here—Don Rickles, Rod Steiger and his publicist, Ed McMahon (who has a particular affection for Chasen's bartender—what a shocker)—and this is allegedly the place where Ronald Reagan proposed marriage to Nancy Davis. So you can see what the appeal of the place was, and if you like this sort of thing, it's a kick to see a montage, set to Frank Sinatra singing The Way You Look Tonight, of Chasen's customers: Grace Kelly, Dean Martin, Lucy and Desi, Liz and Eddie. You can also see why the place lost favor, in a town of social x-rays and recreational colonics—the classic Chasen's dish is a piece of red meat cooked in fat, butter, and salt, and really should come with a side of angioplasty. (No doubt Chasen's did their part in drumming up business for Cedars-Sinai, down the street.) The staff were certainly a bunch of characters, and the directors, more famous these days for American Splendor, delight in them. One of the waiters, Tommy Gallagher, would say anything to anyone, and was happy to crash anybody's photo shoot—it's just a pip to see a snapshot of Frank, Sammy, Dean, and a waiter; or of Presidents Carter, Reagan, George H.W. Bush, Clinton, and that same waiter. One of the women on staff inspired Donna Summer to write She Works Hard For the Money; another, the banquet manager, deserves his own reality show. No knight on a white horse rushes in to rescue Chasen's, which closes after its last Oscar party; a few months later, Gallagher passed away, and his funeral makes for a fitting coda for the film. Among those in attendance were Lew Wasserman and Angie Dickinson. Not bad for a guy with a song in his heart and a bowl of chili on his tray. Image Transfer Review: The feature was wisely shot on film, and not video, and hence looks better than most documentaries; still, inherent in the form is a certain technical rockiness, though visually what's here is perfectly acceptable. Audio Transfer Review: Nice, balanced transfer here, with little buzz or hiss. Extras Review: The filmmakers are joined by Raymond Bilbool, Chasen's former banquet manager, for a commentary track that turns into a celebration of all things Raymond—he's quite a character, and there's much more about him and his bed-and-breakfast than about the movie. But he's a pistol, that's for sure; he served as the inspiration for one of the actors in the Broadway musical version of Victor/Victoria. Included also are brief bios for Pulcini and Berman; recipes for Chasen's famous chili and hobo steak; a photo gallery, which is a collection of snapshots from the shoot; and a Docurama catalog with many trailers. Also, a few demerits to our friends at Docurama, for spelling Ronald Reagan's name wrong on the copy on the back of the case. When all that's left in America are Red Lobsters and Denny's and Starbucks, we'll pine for places like Chasen's, and this film is a lovely elegy to a time and place that we won't see again.